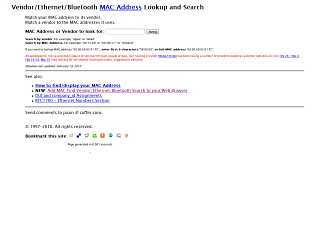 Every device that has network capabilities has to have a MAC address. This unique identifier is like a global serial number. The format of a MAC address is six pairs of hexadecimal values. In other words, 00:00:00:00:00:00 through FF:FF:FF:FF:FF:FF are all valid network identifiers. The first three pairs of the MAC address identify the company who manufactured the part. Knowing that piece of information alone can greatly help in identifying equipment during troubleshooting. This tool will help you reference a devices MAC by identifying the manufacturer of equipment you input.